A centriole, showing the nine triplets of microtubules. Transmission electron microscope image. 3-dimensional view of a centriole. A centriole is a small, barrel-shaped, sub-cellular structure typically consisting of nine triplet microtubules (nine groups of three fused microtubules) arranged in a hollow cylinder. Centrioles are found in most animal eukaryotic cells, but are absent in higher plants and fungi (Quarmby and Parker 2005). The play an important part in cell division, cell organization, and formation of cilia and flagella. Although often referred to as an "organelle," a centriole lacks its own distinct membrane and thus is not an organelle in the narrower sense of structures that are separately enclosed within their own lipid membrane. Rather, the wall of the centriole is formed by the nine groups of microtubules. Some organelles have other forms, including those with nine doublets or nine siglets (Delattre and Gönczy 2004; Leidel et al. 2005). Commonly, centrioles exist in pairs, with the two centrioles positioned at right angles to each other (Alberts et al. 1989). 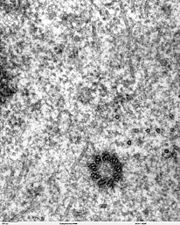 An associated pair of centrioles, arranged perpendicularly and surrounded by an amorphous mass of dense material (known as the pericentriolar material) constitutes the compound structure known as the centrosome, which is important in organizing microtubules in the cell and cell-cycle progression (Edde et al. 1990). The centriole is just one part in the extraordinarily complex and yet intricately coordinated environment inside a cell. The walls of each cylindrical centriole are usually composed of nine triplets of microtubules (protein of the cytoskeleton). One of the microtubules in a triplet is a complete microtubule, but the other two adjacent microtubules are incomplete in that they share part of their common wall. Each triplet of fused microtubles is tilted inward toward the central axis at an angle of around 45 degrees to the circumference (Alberts et al. 1989). This gives what may be described as a pinwheel or cartwheel type arrangement or an arrangement like the blades of a turbine (Alberts et al. 2002). Adjacent triplets are linked along their length (Alberts et al. 1989). In addition to the nine triplet microtubule blades in a cartwheel structure, each centriole generally includes the proteins centrin, cenexin, and tektin (Rieder et al. 2001). Deviations from this structure include Drosophila melanogaster embryos, with nine doublets, and Caenorhabditis elegans sperm cells and early embryos, with nine singlets (Delattre and Gönczy 2004; Leidel et al. 2005). Cells usually contain two complete centrioles during the G0 phase ("post-mitotic" part of the cell cycle where cells exist in a quiescent, non-dividing state) and the G1 phase (the cell cycle during interphase, after cytokinesis and before the S phase, which for many cells is the major period of cell growth when new organelles are being synthesized). The older of the two centrioles in a pair is termed the mother centriole, whereas the younger is termed the daughter centriole. During the cell division cycle, a new centriole grows from the side of each of the existing "mother" centrioles. After centriole duplication, the two pairs of centrioles remain attached to each other in an orthogonal configuration until mitosis, when the mother and daughter centrioles separate in a manner dependent upon the enzyme separase (Tsou and Stearns 2006). The two centrioles in the centrosome are connected to each other by unidentified proteins. The mother centriole has radiating appendages at the distal end of its long axis and is attached to the daughter centriole at the other proximal end. Each daughter cell formed after cell division will inherit one of these pairs (one older and one newer centriole). Duplication of centrioles starts at the time of the G1/S transition and ends before the onset of mitosis (Salisbury et al. 2002). Centrioles are involved in the organization of the mitotic spindle and in the completion of cytokinesis (division of cytoplasm of a single eukaryotic cell into two daughter cells) (Salisbury et al. 2002). Centrioles were historically thought to be required for the formation of a mitotic spindle in animal cells. However, recent experiments have demonstrated that cells whose centrioles have been removed via laser ablation can still undergo mitosis (La Terra 2005). Additionally, mutant flies lacking centrioles can develop almost normally, although the adult flies lack flagella and cilia, a lack that underscores the requirement of centrioles for the formation of these organelles (Basto et al. 2006). Cells whose centrioles have been removed (either via laser ablation, or genetic manipulation) lack aster microtubules. These cells often fail to undergo proper asymmetric cell division, as the aster microtubules help to position the spindle within the cell. Centrioles are a very important part of centrosomes, which are involved in organizing microtubules in the cytoplasm (Feldman et al. 2007; Beisson and Wright 2003). The centrosome is an organelle that serves as the main microtubule organizing center (MTOC) of the animal cell, as well as a regulator of cell-cycle progression. The centrosome is thought to have evolved only in the metazoan lineage of eukaryotic cells (Bornens and Azimzadeh 2007). Fungi and plants use other MTOC structures to organize their microtubules (Schmit 2002; Jaspersen and Winey 2004). Although the centrosome has a key role in efficient mitosis in animal cells, it is not necessary (Mahoney et al. 2006). 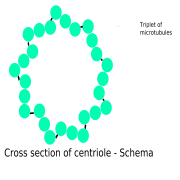 Centrosomes are composed of two orthogonally arranged centrioles surrounded by an amorphous mass of pericentriolar material (PCM). The PCM contains proteins responsible for microtubule nucleation and anchoring (Edde et al. 1990), including γ-tubulin, pericentrin, and ninein. The position of the centriole determines the position of the nucleus and plays a crucial role in the spatial arrangement of cell organelles. In organisms with flagella and cilia, the position of these organelles is determined by the mother centriole, which becomes the basal body. An inability of cells to use centrioles to make functional cilia and flagella has been linked to a number of genetic and developmental diseases. In particular, the inability of centrioles to properly migrate prior to ciliary assembly has recently been linked to Meckel-Gruber syndrome. Additionally, proper orientation of cilia via centriole positioning toward the posterior of embryonic node cells is critical for establishing left–right asymmetry during mammalian development (Feldman et al. 2007). Basto, R., J. Lau, T. Vinogradova, A. Gardiol, C.G. Woods, A. Khodjakov, and J.W. Raff. 2006. Flies without centrioles. Cell 125(7): 1375-1386. Retrieved July 8, 2008. Beisson, J., and M. Wright. 2003. Basal body/centriole assembly and continuity. Current Opinion in Cell Biology 15: 96-104. Retrieved July 8, 2008. Bornens, M., and J. Azimzadeh. 2007. Origin and evolution of the centrosome. Adv. Exp. Med. Biol. 607: 119–129. Retrieved July 8, 2008. Delattre, M., and P. Gönczy. 2004. The arithmetic of centrosome biogenesis. Journal of Cell Science 117: 1619-1630. Retrieved July 8, 2008. Edde, B., J. Rossier, J. P. le Caer, E. Desbruyeres, F. Gros, and P. Denoulet. 1990. Posttranslational glutamylation of alpha-tubulin. Science 247: 83–85. Retrieved July 8, 2008. Feldman, J.L., S. Geimer, and W.F. Marshall. 2007. The mother centriole plays an instructive role in defining cell geometry. PLoS Biol 5(6): e149. Retrieved July 8, 2008. Jaspersen, S. L., and M. Winey. 2004. The budding yeast spindle pol body: Structure, duplication, and function. Annu. Rev. Cell Dev. Biol. 20: 1–28. Retrieved July 8, 2008. La Terra, S., C.N. English, P. Hergert, B.F. McEwen, G. Sluder, and A. Khodjakov. 2005. The de novo centriole assembly pathway in HeLa cells: Cell cycle progression and centriole assembly/maturation. Journal of Cell Biology 168(5): 713-722. Retrieved July 8, 2008. Leidel, S., M. Delattre, L. Cerutti, K. Baumer, and P. Gönczy. 2005. SAS-6 defines a protein family required for centrosome duplication in C. elegans and in human cells. Nature Cell Biology 7: 115-125. Retrieved July 8, 2008. Mahoney, N. M., G. Goshima, A.D. Douglass, and R.D. Vale. 2006. Making microtubules and mitotic spindles in cells without functional centrosomes. Curr. Biol. 16(6): 564–569. Retrieved July 8, 2008. Quarmby, L. M., and J. D. K. Parker. 2005. Cilia and the cell cycle? J. Cell Biol. 169(5): 707–710. Retrieved July 8, 2008. Rieder, C. L., S. Faruki, and A. Khodjakov. 2001. The centrosome in vertebrates: More than a microtubule-organizing center. Trends in Cell Biology 11: 413-418. Salisbury, J. L., K. M. Suino, R. Busby, and M. Springett. 2002. Centrin-2 is required for centriole duplication in mammalian cells. Current Biology 12(15): 1287-1292. Retrieved July 8, 2008. Schmit, A.C. 2002. Acentrosomal microtubule nucleation in higher plants. Int. Rev. Cytol. 220: 257–289. Retrieved July 8, 2008. Tsou, M.-F., and T. Stearns. 2006. Mechanism limiting centrosome duplication to once per cell cycle. Nature 442(7105): 947-951. Retrieved July 8, 2008. This page was last modified on 22 July 2008, at 17:07.